See the new figures coming from Mezco Toyz. New Transformer Siege figures coming our way in 2019! Check out images of new Marvel Legends Figures heading our way from Hasbro! Red Arremer Action Figure from Ghost n’ Goblins. Funko has updated us with official photos and a release date for their new DC Primal Age toy line. Follow the link over to Amazon and pre-order yours now! They start shipping November 15th. The ‘80s were an undeniably glorious decade for toys, and action figures in particular. The heroes were ripped and the playsets were epic. Combine the classic 5.5” action figure aesthetic with DC Comics’ greatest superheroes and villains and you get DC Primal Age—a brutal, barbaric world ruled by bloodthirsty warriors. Wonder Woman, Batman, Batman’s beast ride Ace the Bathound, Aquaman and Green Lantern face off against Scarecrow, King Shark, Mr. Freeze, the Joker and The Joker Beast. And all of this takes place in the formidable Batcave, a lair carved from stone and the perfect playset to round out the DC Primal Age collection. The muscles are big and the stakes are even bigger. Hoarde them all! Diamond Select Toys Bringing Bruce Lee Back. Diamond Select Toys doing big things in 2019. Click the link to find out just what. 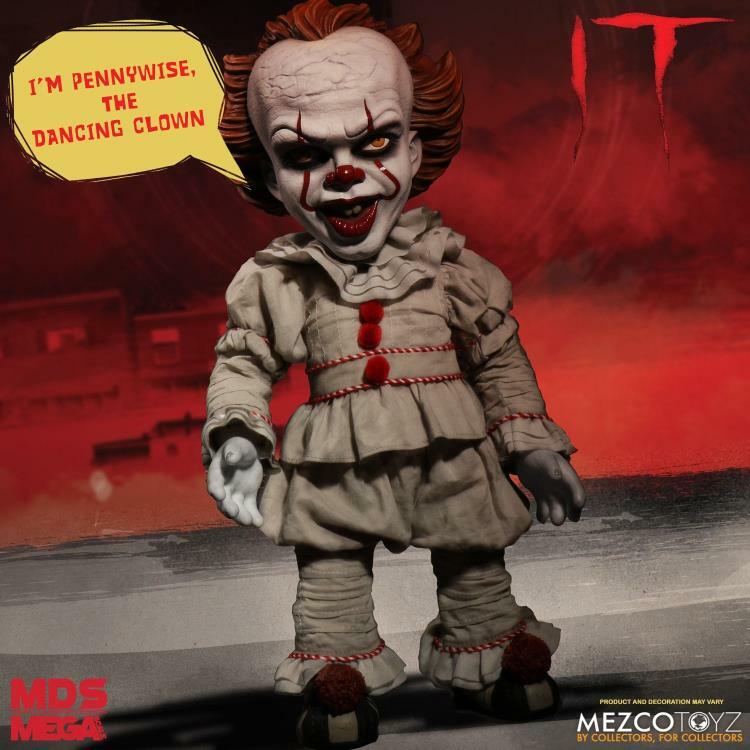 It (2017) Mezco Designer Series Talking Pennywise. Stephen King is my favorite author still to this day. My love for King’s work first bloomed with film adaptations of some of his most influential pieces of work. Christine sparked my love for old cars and love stories…yes, I consider Christine to be one of the best love stories written. Tommyknockers fueled my interest in the unknown and how to say no to drugs..wink wink.. And IT, well IT fueled my interest in storytelling and the supernatural. To this day, IT is still my favorite book written so when I see new products coming out, my inner clown gets excited. Coming in May of 2019, will be the The M.D.S. 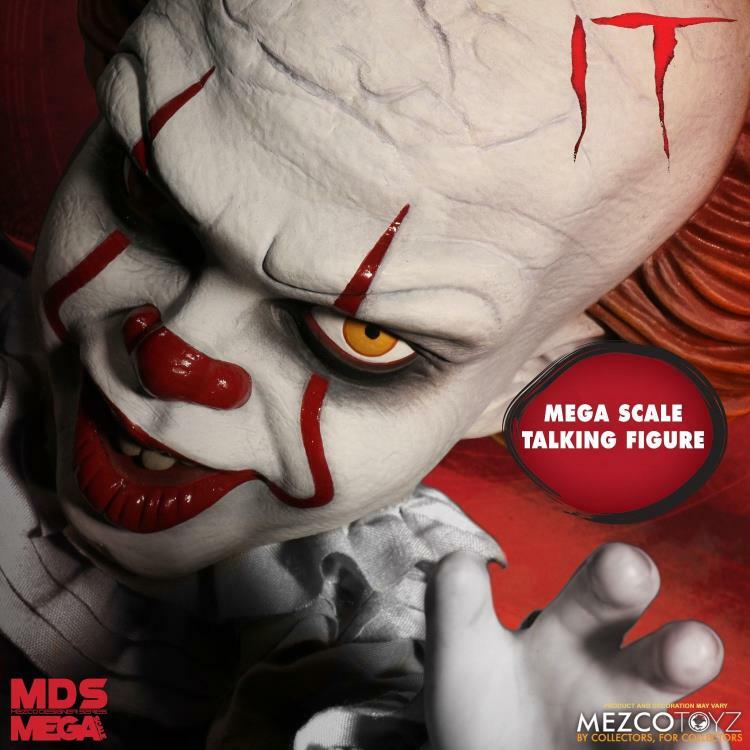 (Mezco Designer Series) Mega Scale Talking Pennywise figure from Mezco. This 15” spooktastic clown comes packaged in a collector-friendly window box, so it’s perfect for display. Standing 15 inches tall The M.D.S. Mega Scale Talking Pennywise is dressed in a real cloth clown suit. 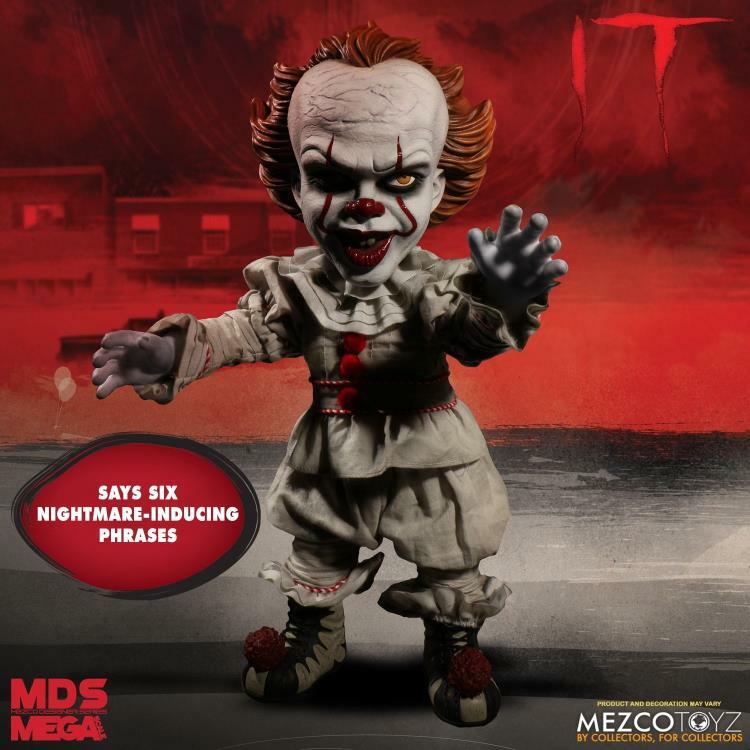 Pennywise is fully articulated and says some of his most nightmare-inducing phrases from the film. 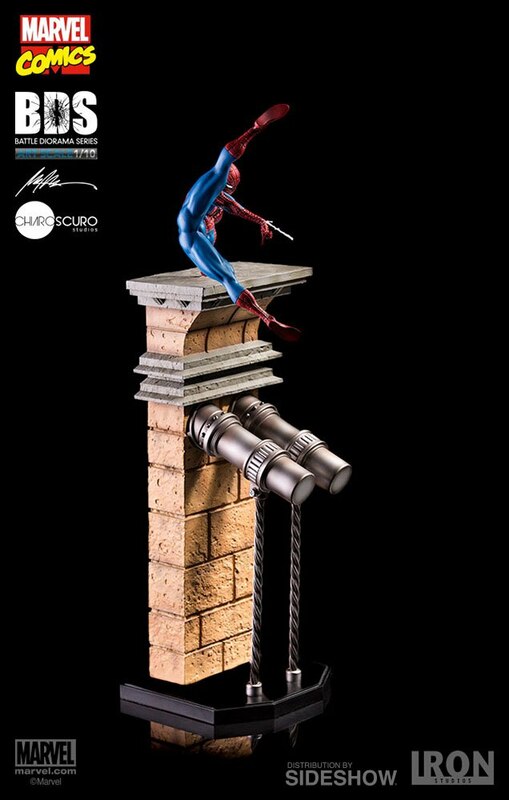 You can pre-order this now from Mezco Toyz, BigBadToyStore.com or where every else Mezco is sold! Mezco: Toy Fair 2019 Captain Marvel Reveal. Mezco teases us with the first look of Marvel’s Captain Marvel One:12 Collective Figure. Mezco PX Cable (X-Men Version) Out Now For Pre-Order. Mezco's Cable is getting the Blue and Yellow treatment in this new PX Exclusive. This “Keaton” Style Black and Gold Batman is sure to impress. Out now for pre-order. Shipping now! You can still join that wait list though. 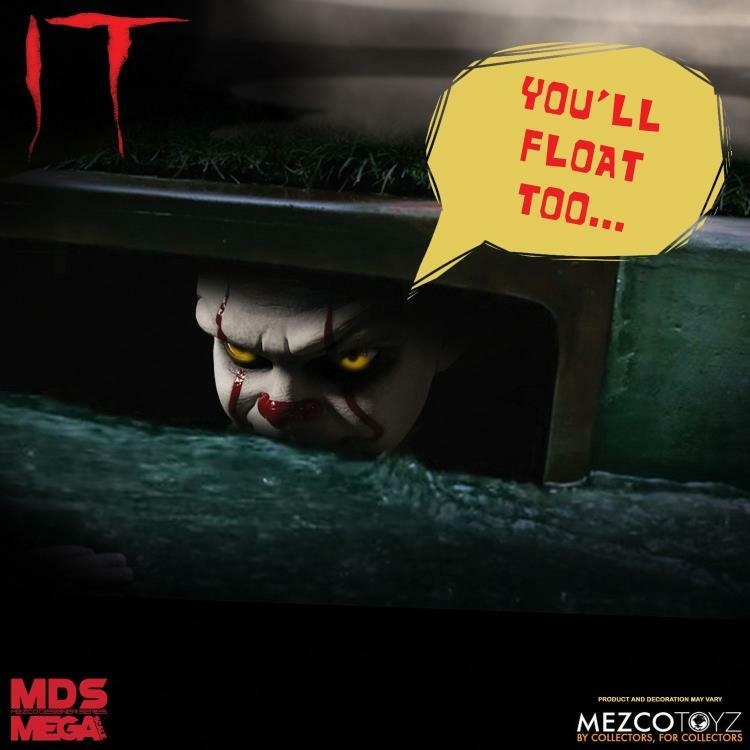 Mezco One:12 A Nightmare On Elm Street Pre-Order. Mezco has opened up Pre-Order for the One:12 Scale Freddy Krueger from Nightmare On Elm Street. Mezco One:12 Cyclops PX Edition. Pre-Order Now: Mezco One:12 Spider-Man Homemade Suit Edition. Can you just ship the one I pre-ordered over a year ago? DIE HARD Funko POPs coming October. Oh’ holy night! The POPs are brighly shining. Shipping this week from Neca. Mafex Venom out July 2019. FUNKO POP NYCC 2018 Exclusives. Today (9/24) is your last chance to enter Funko POP’s online lottery to gain access to their NYCC booth! Back in July of 2018 the internet was flooded with announcements that Walmart was going old school with exclusive reissue G1 Transformers. Yeah, that’s right! Well one month later and Walmart opened up the pre-order door for these robots in disguise. Walmart announced that the first wave of Transformers getting the Wally-World G1 reissue treatment would be Hot Rod, Starscream, Constructicons (Devastator), Legion Class Tailgate, Legion Class Swerve, Legion Class Outback and Legion Class Bumblebee. So why am I telling you this? Well it’s come to my attention that consumers are receiving their pre-ordered items and or finding them in stores across the western part of the U.S. and in Canada. With my love for Transformers in high gear and especially my love for the Constructicons, I thought I’d share product pictures from people lucky enough to have this in their collection and for this article, we’ll stick to the Constructicons. For people concerned about the label “reissued G1” and the product authenticity don’t get your gears in a bind. Transformer reissues were made using “the original production tooling including die-cast parts and even the classic heat-sensitive stickers.” Remember, you had to rub the sticker on the transformers to find out if it was a spy? The heat from rubbing would reveal their Autobot or Decepticon badge. The package too is getting the reissue G1 touch and oh has it never looked so damn good. Bright colors, crisp and sharp to the eye. The packaging itself is something to marvel over and definitely deserves a place among your collection, displaying in all its glory. So that’s it. These beautiful reissues pieces stay true to authenticity with both sculpt and packaging. What else can a Transformer collector ask for beside the original product piece that was lucky enough to get the reissue makeover. If you ask me, I like this idea. Now, there is no need to hunt swap meets, yard sales and flea markets for that constructicon with flaky chrome, a chewed up hand and dry coca cola from 1988. Now enjoy these pictures below. If you excuse me, I need to go hunt Ebay for hours upon hours and find me that Devastator. Until next time. Keep up the good hunt and collect on! We got a sneak peak of upcoming Marvel Legends. The night he came in the mail. Aquaman Movie toy sets coming from Mattel. Aquaman Movie Figure sets coming soon. Sideshow Collectibles: Iron Studios Spider-Man Statue. Spider-Man, We all know his story. If you would like a refresher please continue reading courteous of Sideshow Collectibles. If not jump down to row 4. Ahhh, Peter Parker; an orphan raised and educated by a loving aunt and uncle. As a teenager, during an experiment, a genetically modified spider bit Parker and so his DNA was altered and he came to have the proportional powers of an arachnid, such as jumping long distances, extended force, adhesion and the ability to scale surfaces in any sense or height, and a precognitive sense that warns him of impending danger. With his natural scientific genius, he developed a device that allowed him to launch artificial webs, created a blue and red costume and adopted the code name of Spider-Man. Parker ignored the chance to stop a fleeing thief, and in a tragic irony, the same criminal killed his Uncle Ben. He hunted and arrested the killer, and when he recognized him, he felt responsible. Since then, he has adopted an ethical code of a phrase from his uncle: "With great powers come great responsibilities," and went on to fight crime. Created by Stan Lee and Steve Ditko in 1962, and owner of an extensive gallery of supervillains, and one of the biggest stars in the Marvel universe. 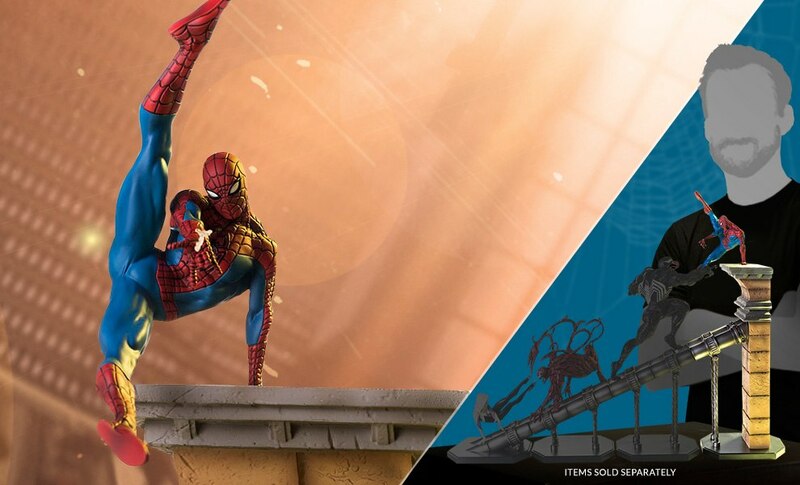 Iron Studios has released in my opinion is the best looking 1:10 Battle Diorama of our friendly neighborhood crime fighter, Spider-Man. This statue piece makes up one of four pieces, when put together, will display one outrageous battle scene that pits Spider-Man and Spider-Gwen against the symbiotes Venom and Carnage! Based on the concept art of Raphael Albuquerque from Chiaroscuro Studios all four of these pieces are limited editions. Made in Polystone with amazing details and hand-painted colors. This Spider-Man piece along with his counterpart pieces compliment each other very well when displayed together. However, displaying these separate might be somewhat acquired, it can still be done. This method doesn’t take away from the piece being displayed picture below will have you wanting all four for your collection. Reasonably priced, I like that collectors of any budget can have quality collectibles available to them. Each one of these statues are priced at individual prices, but they do not seem to differ to dramatically. Which gives collectors the motivation and means to purchase all four. Let me know if you’ll be picking these up! I’m working on getting all mine now (if only Mezco can stop putting out that heat). Until next time. Enjoy the hunt and collect on! Mezco NYCC Exclusive: Dr. Strange update. 1000 Toys- Iron Giant Statue. 1000 Toys at it again. Coming soon.